3. Choose instance type. Avoid small instances because Univa Grid Engine will run very slow. The m4.xlarge instance type is the default for Univa Grid Engine. 4. Select a Amazon Virtual Private Cloud (VPC). Many Amazon EC2 instance types are only supported with a VPC and running Univa Grid Engine in a VPC ensures there are no additional network issues with the cluster once you start adding nodes. It is highly recommended you use a VPC. 6. Choose the Keypair that will be used with this instance. Note: the IAM role must be added to the Univa Grid Engine Master Instance after the instance is launched and before any other commands or compute nodes are added to the cluster. Select the instance in the Amazon AWS console and right click on it to select 'Instance Settings->Attach/Replace IAM Role' and attach the role to the instance. 3. From the EC2 Console choose the instance type. Avoid small instances because Univa Grid Engine will run very slow. The m4.xlarge instance type is the default for Univa Grid Engine. 4. Select the Network. Univa highly recommends you create or choose a Amazon VPC. Many Amazon EC2 instance types are only supported with a VPC and running Univa Grid Engine in a VPC ensures there are no additional network issues with the cluster once you start adding nodes. 5. Choose the Subnet within the Amazon VPC. There may only be one subnet in that case it is an easy choice. 8. Move to Add Storage step and update the storage size. The default is 10 GiB. Increase the storage size if necessary. For larger clusters more storage is needed and 10 GiB is not sufficient. 9. Next, optionally add tags to the instance. 11.Select Launch and choose the Keypair to be used with this instance. This new instance will host the Univa Grid Engine qmaster. Should the plan be to deploy Univa Grid Engine at a scale of 100s to 1,000s of nodes, to execute 100,000s of jobs simultaneously, a more capable instance type may be warranted. Please consult the documentation regarding Univa Grid Engine for additional details. The instance type m4.large will be used by default for compute nodes. Consult the documentation for Navops Launch should multiple, different types of instances be required or the instance type is not supported in the selected region. Please continue with the sections below to configure the security group and Univa Grid Engine for Workload-Managed Computing. Before proceeding to login to the new Univa Grid Engine master instance the Security group attached to the instance needs to be configured to allow all traffic from hosts in the same security group. Each security group name is unique so this rule must be added manually. The last rule in the image below allows traffic for all members of the security group, so any node in the group can communicate with other nodes in the group. If the option to make use of an IAM role was not selected, AWS access and secret access keys will be prompted for manually via the command line. 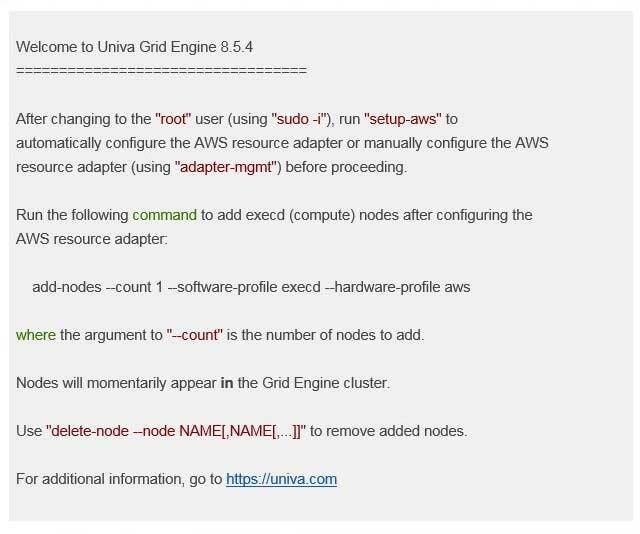 At this point, AWS has been configured for use with Univa Grid Engine. In fact, as noted above, a single compute node can be added manually via the command "add-nodes --count 1 --software-profile execd --hardware-profile aws". (Note that the integer value after "--count" can be adjusted to add additional compute nodes.) Details regarding the "add-nodes" command, as well as the referenced profiles, can be found in the documentation for Navops Launch. Compute nodes will be automatically enabled to execute workload in a managed fashion via Univa Grid Engine. To ensure their availability from a workload-management perspective, the "qhost" command allows for a rapid check of suitably enabled compute nodes. Because various metrics have been successfully obtained from the 4 compute nodes identified below, these nodes are ready to execute workload via Univa Grid Engine. Details on use of Univa Grid Engine from the perspective of an end user is available via the Users' Guide; additionally man pages are available online via the running instance, and the interested user is directed to those pages relevant to job submission ("man qsub") plus monitoring and accounting ("man qstat" and "man qacct", respectively). For those who seek to fine tune the configuration of their Univa Grid Engine cluster, detailed information can be found in the Administrator's Guide; additionally, online man pages are provided, and the interested administrator is directed to "man qconf" as a starting point. Univa offers training courses throughout the year at various locations internationally; please consult Training & Courses for additional details such as the course syllabus and current schedule. Finally, manually deleting nodes is also noted in the Message Of The Day (MOTD) output. Univa Unisight is the monitoring and reporting solution designed exclusively for use with Univa Grid Engine. This offering from AWS Marketplace has been designed to significantly automate the installation and integration of a fully functional deployment of Unisight. Upon completion, the script exits with the URL of the Unisight WebUI - for example, "http://.compute-1.amazonaws.com:3003". Cut and paste the URL displayed on the console into a safe place, it will be needed later to login to Unisight. At this point, a fully functional deployment of Univa Grid Engine enabled with monitoring and reporting via Univa Unisight, is ready for immediate use. If you cannot login to Unisight or Unisight does not launch properly please contact support@univa.com for assistance. 1. Enable Univa Unisight as a component via the command "enable-component --software-profile unisight unisight". Note that invoking this command will have the effect of downloading software tarballs from AWS S3, and subsequently making them available for use locally. This command also has the effect of enabling reporting for workload managed via Univa Grid Engine. 2. To employ a different instance type, issue the command "adapter-mgmt update -r aws -p unisight -s instancetype=", where "" is a placeholder for the type preferred over the "m5.xlarge" default. 4.Finally to deploy a standalone node for the monitoring and reporting service, and subsequently install and integrate Unisight with the existing deployment of Univa Grid Engine, it is necessary to issue the command "add-nodes --count 1 --software-profile unisight --hardware-profile aws -A unisight". Once issued, the instance will appear via the EC2 Dashboard with "Unisight" as its name, and the user will be directed to the URL of the Unisight WebUI. For additional details regarding Univa Unisight please consult the Administration Guide, and/or the related resources (e.g., our webinars) that are available online at http://www.univa.com/resources/.